This essay examines Montreal, QC and how the city has successfully created public space where people want to spend their evenings, weekends, and free time. Many people will argue that Montreal is a winter city and the few short months when it is sunny and warm force people to come out of their homes and spend time outdoors before the next snowstorm…This however, would fail to recognize the many successes the city has achieved in planning and designing public spaces within the context of the city. A description of Montreal’s efforts is shared below. Because many people are on the street in the evening, there is an energy that is tangible. Many people are going to a cafe, park, or public space. There is an inviting feeling on the street-level. Jan Gehl theorized that cities of this density are more neighbourly because you can see facial features of those who pass by and connect with them. Any increase in building height will lose this key advantage. Many Montrealers feel welcome in their cities because of the availability of affordable housing. The availability of greater affordable housing through the city allows people of diverse backgrounds and incomes to access public space and parks that are scattered throughout the city. Research conducted by Anne-Marie Seguin and Annick Germain at the University of Toronto examined the City of Montreal during the 1990s, a period where the city was challenged with poverty, unemployment and increasing rates of immigration. The researchers examined census tracts where 30-40% of the population was low income, but found that the neighborhoods maintained a social mix that was reflective of the greater Montreal Census Metropolitan Area; the census tracts studied were not dominated by groups of unemployed, uneducated, recently immigrated, or other disadvantaged groups. The researchers pointed to strong governmental partnerships and initiatives to promote access to education, access to health resources, and the prevalence of strong initiatives to build affordable housing or renovate older housing stock. Coming back to the design of the rowhouses, from street-level there are no visible “poor” or “higher incomes” in row-houses because of the similarity in form and material. Any distinction between the rowhouses happened as a result of resident personalization rather than the developer or city guidelines. Unlike cities that promote basement suites or other “hidden” forms of density where the single family house remains supreme, the plex design is equal to everyone regardless if someone wishes to live at street level, second floor, or third. Because neighbourhoods are designed similarly with row-houses or plexes, there are less rich enclaves within the city where people of a certain economic class are only welcomed to a public space or park, or not welcomed. The glass tower which Vancouver is famous for allows someone to access their version of public life, without actually participating in it. Contrasting against Montreal’s livable density is a propensity of towers found in Vancouver or Toronto. Towers designed to “maximize” views lend themselves to just observing outside and to see far distances, not people. There is a clear disconnection from the ground level. Vancouver and the region specializes in these towers where residents are more apt to stay in their apartments, or amenity rooms while looking over far distances such as the north shore mountains rather than life on the street. This might be the most controversial opinion offered in this essay, but it should be noted that the plexes and row-homes in Montreal have little or no amenity spaces such as rooftop pools, tennis courts, gyms, or even large backyards. These design elements that planners will agonize over and over-design, will add costs to a strata or rental rates that may be too much for an average to below average earner. Rather, Montreal encourages use of public space by placing fountains, sprinklers, and picnic areas in each neighbourhood. As a result all residents of different backgrounds are able to access the shared spaces. An innovative step to create more place for people in Montreal was the launch of the “ruelle vertes,” or green alleys initiative which would took space from vehicles in rear lanes and converted them to green routes that are traffic calmed, or completely pedestrianized. The ruelle vertes often become playground for children, or places where neighbours can sit and have a shared meal. The city recognizes that there is an abundance of creative and cultural capital in the city. One way that the city promotes this capital is by permitting a wide variety of events in vacant industrial areas, parking lots, and parks. The city allows its residents to host temporary displays or concerts in parks that may only last a weekend, or the entire summer. Two major pop-ups in the Mile-End neighbourhood this summer were the Aire-Commune event space, and the Marché des Possibles. In both cases, there existed vacant land that was to be transformed. Aire-Commune used a gravel lot near a railway to create a shared workspace for creatives during the day and event space at night. Supporting this initiative was the amount of office workers nearby, who would choose to come out and enjoy the sun while they worked or met clients during the day, then meeting friends after work. Montreal also renewed a section of industrial waterfront to create a beach-like atmosphere in the middle of the city. The Pied Du Courant was a popular event space for the World Cup and throughout the summer as different musical acts played and people could have BBQ’s along the water. Marché des Possibles, on the other hand used a parking lot site and a small parklet to host weekend markets and concerts featuring local bands and DJs. An informal stage was set-up in the parklet and different themes were able to decorate the park, such as a Japanese theme. The parking lot was taken over and used for food trucks where young people or families could buy dinner and enjoy it outside or have a beer. There were no onerous parking requirements or a roped-off zone where people could drink, rather people were able to wander around the parklet, or even head over to the nearby Aire-Commune. Montreal has been able to successfully create and animate their public space by allowing people to feel welcome in all parts of the city. This has been no easy task, and has required planning efforts in all stages and sectors within the city. In order to allow multiple people to stay in the spaces, Montreal has committed to affordable housing in all parts of the city so there are no rich or poor enclaves or spaces. This is a commitment to the flexible and dense housing form found throughout the island of Montreal, the rowhouse. Strategically placed affordable housing initiatives using this housing form, as described by Anne-Marie Seguin have been important in fostering equity in the city. Montreal also recognized that people have different incomes and expenses, so the city is designed in a way that people can vacation in their city and spend time in greenspace. The only way to vacation or enjoy the summer is not just loading up an SUV and heading to a large park outside of the city. The results have been excellent and the city feels lively. Finally, the City has allowed flexibility in requirements to allow creativity and culture to flourish within the City. “No Fun City” rules have not been able to dominate the landscape and restrict citizens from enjoying themselves in the diverse and numerous pop-up events all over the city. Cities across Canada can learn from Montreal if they wish to creative fun and inclusive cities for people. Seguin, Anne-Marie, and Annick Germain. The Social Sustainability of Montreal: A Local or State Matter? The Social Sustainability of Cities: Diversity and the Management of Change. University of Toronto. Slow Streets offers public life behavioural observation and street design consultation firm. Working with Slow Streets is a great investment because not only would you benefit from the expertise from an experienced city planning engineer but you would receive high quality and results-driven customer oriented service. Working with Slow Streets is critical for vibrant, economically sustainable cities because you will see an increase in the return on your investment such as increased rates of cycling, walking and transit, improved retail business success and improved public spaces. Click here to read a review of our work. Canadian cities are experiencing record rates of growth and are increasingly choosing to densify rather than sprawl outwards. Densification can help a city reduce traffic and car use, maintain sensitive environmental and agricultural lands in the periphery, increase affordability, and generally create a more attractive and walkable city. Missing-Middle Housing, housing that is low to medium density, is important for city growth because it offers a variety in housing types rather than just single-family or condo towers. Missing-Middle housing is NOT six-storey or above apartment buildings, 40-unit townhouses, or something similar. The variety of housing is important for city growth because it can be constructed faster than apartments, can suit irregular lot patterns, and encourage a variety of builders with different backgrounds to build. Missing-Middle housing is able to maintain existing street patterns including lot sizes, landscaping standards, and light penetration. This style of housing is often more human-scale and creates more walkable neighbourhoods than either single-family houses or massive apartment buildings. Missing-Middle Housing can offer affordability solutions because it is faster to build, is accessible to a greater number of builders/designers who may have different goals, and constructions costs are the cheapest per square foot. to be flexible in form to maximize the number of housing units. Considering the gains possible Missing-Middle Housing, why would cities make it difficult to develop these forms of housing? The answer lies in the permitting process which cities use and cannot seem to tear themselves away from. In general cities prefer to be risk averse. The “Process” – Cities in Metro Vancouver will often require several applications to develop housing. The most notable and contentious is the Rezoning Application. A rezoning is a catch-all application where cities are legally able to require additional conditions for development. The process of rezoning also ensures the risk of the application is on the developer, who sometimes must prove to a neighbourhood why a City’s official plan is in good order. Permission to develop a triplex (three-unit attached) in a single-family neighbourhood can appear to be similar to developing a large tower. The process often allows a small group of citizens to “hi-jack” the system. The risk of having an application rejected can be too much for a smaller developer, but is bearable for larger developer and development. The rules and process set by cities is suited towards the latter. The goals of infill, as mentioned earlier, are often lost altogether when trying to manage requirements of city zoning bylaws. Zoning bylaws are best implemented in greenfield sites where lot patterns can be drawn up from scratch and established cultural fixtures, monuments, points of interest, or well-loved community aspects do not already exist. A final note on zoning is that there are restrictions on use, so there are limited opportunities for small-scale retail, cafes, corner stores, studios for artists, or even home offices. This regulation eliminates the possibility of a “live-work” building, one of the prominent forms of missing-middle housing. Minimum Lot Size / Lot Consolidation– Planning departments prefer (then require) lot consolidations in order to create orderly developments that meet Zoning Bylaw standards. Requirements for lot consolidations conflict with runs the risk that the developer cannot afford an additional lot, or cannot finance the costs of a larger building. The additional lot may not be for sale which can stop a missing-middle development from even beginning. The lots often become cookie-cutter, when contrarily the most interesting urban developments are random and can offer interesting stories for neighbours! Off-Street Parking Requirements – Cities will often choose high parking rates that suits single family lots with plenty of room, or dense apartment buildings that can pay for underground garages or structured parking lots. Neither of these solutions are feasible for Missing-Middle housing developments which will maximize unit yield and stay low in cost. Fee Extraction (Community Amenity Charges)– A growing trend in city planning is maximizing fees from developments and neighbourhood plans. City real estate departments are often engaged to assess lands and their potential for fee extraction during the neighbourhood planning process. The fees are taken as a condition of rezoning. While this practice is championed in Metro Vancouver, it creates an inherent bias against small scale missing-middle developments that cannot compete against large apartment buildings in the amount of fees collected. More importantly, a major pathway to get more missing-middle housing is avoiding the rezoning process and pre-zone lots to reduce risk, which takes away the potential for cities to extract further fees. To conclude Part 1 of this essay, a slideshow of various Missing-Middle Housing forms are presented along with reasoning on why they would not be permitted today. Many different cities offer best practices on offering dense and liveable housing options for people. A key ingredient in these best practices is common space. Vancouver, through different neighbourhood plans, has set goals to densify single family neighbourhoods although timidly. The City of Vancouver and the region often focuses too narrowly on other functions of infill such as setbacks, height, or parking. These particular items are often static and rigid. If we get away from these items the City of Cordoba, Andalusia, Spain can offer a viable infill option. Cordoba is a historic city in Southern Spain with roots and tradition of building from the Roman Empire. The City has existed under several regimes including early Spanish, Moorish, and under the Franco regime. The predominant housing form in the historic city features several housing units centered around courtyards or patios. Subsequent eras have shaped the city, and added to the housing in Cordoba, but the courtyard style of development has remained and can offer solutions to other cities with goals for infill housing, compact neighbourhoods, and adding amenity space that promotes interaction between residents. The Courtyards (Patios1) of Cordoba are famous for being inward looking and with a few famous philosophers from the region, the citizens of Cordoba have been given a similar reputation. However, the patios are meant to offer green space for the residents and a place to be protected from the sun in the afternoon. An example of a floor plan is provided to the right. Beginning in the Roman Period, the developments were built in one phase with the Courtyard occupying roughly 10-20% of the total site. The courtyards featured a fountain to collect rainwater and would provide shade from the midday heat which is common all year round. Shade would be provided either by trees or second-stories that are on the south side of the building. During the Moorish reign, more plants and floral arrangements were provided in order to give a sense of freshness. The walls were made of stone and whitewashed to reflect the sun away from the inside of the buildings. Whitewashing is a practice of putting boiling water of stones then using the semi-liquid product to fortify the stone walls. This practice is still done today, and is a mark of pride for residents who maintain their homes. Under the reign of Franco, the military dictator of Spain (1938-1973), the developments would undergo change. Landowners from different areas (in and out of the city) rented out the developments, but Franco implemented maximum prices and increases under the direction of the socialist government3. The rents would often be low with little chance to increase rents, resulting in absentee landlords who let the patio developments degrade. The tenants would often be craftspeople or artists, who searched for cheaper rents. The artists took pride in their homes and would decorate them with elaborate floral arrangements, plantings, or instruments which show the history of the patio. This legacy has to present times. Because the artistic arrangements have become so famous, the City now hosts the “Festival of Patios” where the patios open for the public to view. At the end of the Festival, several awards are given to different patios. Residents of the patios often use the festival to advertise their goods that are for sale. Many of the patios that were developed during the Roman period have now become UNESCO heritage sites that are paired with rigid regulations from the City of Cordoba. There is little change possible available in the city centre, and little chance of adding to the existing patio developments. The more recent developments in the City Centre of Cordoba are often converted from old palaces from the Roman Period or the Moorish period. No new conversions are permitted by the city to preserve their history. The converted palaces feature 2 to 3 storey apartments, the maximum height permitted, surrounding a common patio. The city does not permit further site consolidations within the city centre due to UNESCO regulations. No prescriptive design guidelines: Too often in Vancouver, entire city blocks are developed at once in high density developments with glass facades separated from the public realm. Rigid design guidelines further sterilize new housing in Vancouver often with legal agreements putting design into stone. The patios in Cordoba were a self-driven process that allowed residents to personalize their own space. There was a period of deterioration, but residents took it upon themselves to retrofit their spaces, to make the living spaces larger, to add a workshop area, and then allow other citizens to come to their courtyards. Protection from harsh weather: Vancouver’s climate is greatly different than the dry and hot climate of Cordoba. However, the insular nature of the courtyards can allow Vancouver’s rainy and windy winters to let neighbours enjoy common space because the two-to-three storeys can stop the common space from being windswept. The addition of awnings or plantings can help the common space be used during rainy periods. Promote neighbourly interactions (Eyes on the street): Similar to many of Vancouver’s co-ops, a common courtyard can promote community interaction. In the evenings many of the residents prefer to spend their time outside making conversation, or watering their plants. While many of Vancouver’s residents have preferred to only maintain their own lawn or backyard, the patio can help promote more neighbourly interaction. The patio area can also be a social place for children who want to play. No Single Family Housing the Urban Area – The overwhelming majority of Cordoba’s housing stock is multi-family in the form of patios developments or apartments. The development proves that there can be quiet and peaceful urban environments without having single-detached housing only. Affordability – In the case of Cordoba, the modest construction and facades that face the public allowed many of the courtyards to be built quickly with the onus of maintenance being on the residents. The exteriors are often plain, and stonewashed white to reflect heat, but the real character of the buildings are the floral arrangements and decorations that residents offer. When originally built in the Roman Empire, the ancient designs did not offer car parking but did have flexible site designs to allow the maximum number of units possible. Since the developments are able to dense and close to the city centre, many of the residents choose to take the pleasant and car free walk to the city centre. To date, the City of Vancouver and every other city in Metro Vancouver has been unable or unwilling to change single-detached neighbourhoods to a more dense and liveable form. By using the patio form similar to Cordoba, The City of Vancouver can greatly add density, promote more neighbourly interaction, and develop more affordable housing forms. Many similar forms can be found in North America including courtyard rowhouses or apartments, but the patio of Cordoba remains a unique and tested blueprint that can be used in any climate including Vancouver. Courtyards and Patios are interchangeable in this writing. Franco’s Housing Policy: Urban Tenancy Law of 1946. Tenancy laws were made stronger during due to Franco’s socialist policies. It became difficult to evict tenants or charge them greater rents. Spain, like many European cities has great public spaces and corridors that are comfortable for people to walk through. The spaces offer a beautiful solution to sustainable development as people are invited to view and access the city without a car. In Spain, cities like Madrid, Barcelona, and Valencia usually receive the greatest praise for good urbanism within the country, but several notable examples exist in the smaller communities in Southern and Northern Spain. Cordoba in southern Spain is a community of roughly 330,000 inhabitants and known for its Urban form and roots in the Roman Empire. Pamplona is a community in Northern Spain known for the famous Fiesta de San Fermin (bull-fighting) and has a population of roughly 200,000. Both medium sized communities are presented in the following video, and have lessons to offer any Canadian city, including Vancouver. Transit oriented development is a prolific planning method that has shaped Vancouver and its suburbs into pockets of high density near rapid transit stations. With the goal of decreasing sprawling development and car use, TOD encourages more transit usage and compact communities. In Metro Vancouver, a major goal of TOD has been getting commuters to downtown Vancouver without driving, and with ridership close to 500,000 users per day the region of Vancouver has every right to claim success in that respect. However, Transit oriented development in Metro Vancouver has largely missed a critical element of compact communities which is the promotion of place, where people can stop to chat with neighbours, to allow children to play, or to to stay and linger in their neighbourhoods. TOD is developed to be a means for commuters, and not as an ends for neighbourhoods. TOD has not proven to be an ends where populations can feel welcome in their neighbourhoods, to be social, and to express themselves where they live. Studies in many western cities show that a transit station and line can have a rapid effect of increasing private property values, as much as 30-50%, in a short period of time after a transit line has been proposed. Afterwards, property values will jump again when a municipality makes a neighbourhood plan permitting high-density housing. In order to develop the properties towards full value, a developer will often acquire several properties, which can be the size of a city block. This is a costly process, that results in very large scale and phased developments, and are oriented towards luxury housing rather than modest housing. In TOD areas in Metro Vancouver, an “oligarchy” or select group of housing developers have formed to develop around stations. Because of the lack of variety of housing developers, the price for housing (rental or ownership) can often be fixed because there is no modest scale developer who can afford to acquire the site and develop. A further barrier exists to modest scale builders when the high-rise form requires specialized trades, engineers, architects, and project managers to build. Often in TOD, public space is kept to the edge of the property, closest to a busy road where units are less marketable, or sometimes by city design. In the Cambie Corridor Phase 3- Open Space Guidelines (Above). The proposed plaza is along a busy street. Pedestrians will perhaps wait for a bus or connection here, but will not likely stay for extended periods. This plaza faces a lack of enclosure and protection from traffic. In Montreal , CA new tenants or landlords will often renovate their own rowhomes. New colors, fixtures, plantings, or ornaments allow resident to add their own touch to their homes. Glass Towers have been favoured by developers as a winning model, one thatpromotes a view. However, the form has become commonplace and generic in Vancouver to the point where other designs which are more attractive at the ground level are ignored such as different types of brick or those adorned with ornate sculptures, marble, or craftsmanship. The ground level also suffers from another problem, in that the residents of the glass towers can not display their own creativity with new arrangements of flowers, art, different colors of window frames, or different painting. Other housing that is more common in Europe or eastern Canada (Montreal) adds significantly more character through personalization. In response to requirements by municipalities to place commercial units at ground level, or the private sectors desire for larger commercial units, there is a lack of variety at the ground level. Only businesses that can take on larger costs such as chains will take over ground floors facing the public realm. The businesses are often generic and similar. No. 3 Road, Richmond. Many of the retail spaces are dominated by banks which often blank out windows and take away from the public realm. High Density development is a goal that been pursued strongly in Metro Vancouver. However, the region has missed an opportunity for more sensible development options that have been established for years such as low-to-medium density housing and public squares. Development where residents can tailor their neighbourhoods to their likes and as a direct response to their creativity. High density developments have been too sterile, too prescriptive, and do not activate the public realm. A large problem is the requirement to consolidate many lots in order to shape one site, then create requirements for the public realm site by site, and not in a collective manner that has been done historically. How can Vancouver meet goals of densification and do so in a way that can encourage people to walk, to stay in their neighbourhoods, feel proud of their nearby public spaces? The answer may lie in the ideals of “Missing Middle Housing”, or may need to go back to the trend of compact neighbourhoods centred around public squares. The remainder of this summer series will attempt to draw these questions out. The minute we walk out our front door we are influenced by a world that is too complex for our brains to handle. According to Daniel Kahneman in Thinking, Fast and Slow, in order for our brains to simplify and transform this overly complex world into something more manageable, our brains simplifies what we experience with intuitive heuristics. Our brains have two parts, the first is intuitive and automatic, the second is more deliberate and requires focused attention. Most of the time we operate on the intuitive and automatic part of our brain in this complex world of senses. Our brains weed out what it deems as unimportant information, however this simplification comes at cost. In an attempt to simplify our world, our brains have stream-lined our experiences in such a way that our external environments affects our first, automatic and intuitive part of our brain. According to Kahneman and the studies he has conducted something as simple as showing people images that are suggestive of older age causes people to walk slower. When people are ordering food at a menu, you always want to be the first to order as for most people following the first order will change our order to something we might not necessarily want just to make sure we are not seen to be copying someone else’s order. What all of this is trying to say is our behaviour is heavily influenced by our external environment whether we know it or not (most likely we don’t know it). We are prompted by things we see, feel, hear and touch in our environment. This brings me to the question about urban design and how we can use this knowledge. Cities are full of aspirations to enact changes in transportation modal shares, access to park and green spaces and encourage people to uptake healthier and greener behaviours. To achieve these goals we need to prompt your city. The positive impacts from this include encouraging people to act towards being healthier psychologically and physically, we can encourage people to be happier, form more social connections, as well enable us to reduce crime and harassment. According to Doug McKenzie-Mohr the best way to encourage behaviour changes are prompts. Often we are so caught up in our daily lives and the complex maze of bills, doctors appointments, friends and children recitals that we need a reminder to take a second each day for the activities that develop our psychological well being. Prompts can break our train of thought and nudge us to a different habitual behaviour. According to Doug McKenzie-Mohr prompts are the most effective at the location where you want to see the behaviour change. Prompts are also most effective when they are simple, direct and tell people what to do rather than explain why people should do it. It is also important to prompt for the behaviour that you want, not the behaviour that you don’t want. For example putting up a sign that says don’t feed the ducks will actually more likely prompt people to feed them. At Slow Streets it’s no secret we are a fan of the quicker, lighter and cost effective solutions, solutions that can be implemented quickly to garner immediate results today and formalized later when the effectiveness is gauged and additional funding is made available. We are fortunate that we have a low cost and quick way to trial changes to test and evaluate these prompts and maximize their positive benefits. Tactical urbanism is a new method that Mike Lydon has been cataloging for years. The idea is simple, take the concept you want to develop and design it using the most lightest and cost effective materials using the quickest construction methods. It is amazing what you can build and the results you can generate using tactical urbanism. Cars spend 95% of their time parked. Parklets can transform a space for parking a car into a place for people. The great thing about Parklets is their small size which allows you to bring great public spaces closer to where people want to be, on our fine grain retail streets next to all of the interesting shops and restaurants. This again can prompt people to take a few minutes out of their day to stay in the place making it more inviting prompting even more people to fill the streets in a virtuous cycle. To prompt people to reduce their carbon footprint, get more exercise and form better relationships with their neighbourhood and the people in them. We must bring grocery stores, hardware stores and other daily services and amenities closer to where people live so they don’t have to drive and can walk or bike. This means ending land use segregation and introducing mixed land uses, therefore the distance between home and the services is eliminated. This creates an environment based around convenience. Groceries can also be brought closer to where people live to prompt healthier eating and eliminate food deserts with smaller temporary sidewalk farmers markets right in the neighbourhoods. Temporary buildings can also be built to house grocery stores as shown from the photo in the tactical urbanism section. We can prompt improved satisfaction with neighbourhoods and improved mental health by introducing more accessible and high quality greenspace. It can also be as simple as positioning visible, attractive stairs in front of the elevator to encourage more people to take the stairs. Simply having a sign that prompts people to take the stairs is also effective. Other cities have been experimenting with fun and creative visual designs such as piano key steps and race tracks to encourage people to take the stairs instead of the escalators. Another city incorporated a slide into the entrance of a train station. If we move in a way that makes us feel strong and confident we can dramatically change our psychology. There are 43 muscles in our face, simply smiling and laughing can change our mood instantaneously. Better psychology has a direct link with better physiology. Sitting is the new smoking of our times, and it just takes 2 minutes of walking per hour to over come the harmful effects of sitting. Walking is shown to dramatically improve the performance of our brains, we can think more clearly and are more creative and happy when we are walking. According to Jan Gehl, humans have evolved for walking. We have a depth of vision and periphery that is best for appreciating the details of our environment at a walking speed. So we know that exercise can dramatically change our mental health. How can we encourage people to get more exercise? People are investigating Vancouver’s new bikeshare after seeing it for the first time. We can prompt people to take other ways of travelling by making other modes easier and more readily available. This includes adding bike parking on the street. Bikeshares are another low commitment way to prompt people that don’t own a bike or don’t have the space to store a bike into trying cycling. We can introduce bikeshare stations and provide thousands of bikes across the city for a minimal fee. The bikes themselves can serve as prompts getting the best of people’s curiosity. The biggest barrier to cycling is the worry of mixing with fast moving traffic. Using a combination of protected cycling infrastructure & traffic calming to reduce the volume and speeds of vehicles can invite people to cycle. Cycling also benefits from safety in numbers, where the more people that are cycling the safer it becomes because drivers become used to interacting with them so they adjust their behaviour. I would argue that the sight of large volumes of people cycling has a secondary effect of attracting other people to try cycling. If you can’t fight them, join them right? Calgary is the leading example of building an entire network of safe, comfortable and convenient cycling lanes all at once, and it has had an impact attracting over 1 million trips over one year. We can also prompt drivers to understand and respect the safety of other ways of travelling. One of the best things we can do is introduce protected cycling lanes. However most collisions happen at the intersection, therefore by reducing the size of intersections and introducing protected intersection designs would prompt people to respect the safety of people cycling. Physical designs that consistently generate expected driving behaviours are needed. Physical designs include integrating raised intersections/crossings, leading walking intervals and protected cycling infrastructure. However some softer infrastructure can help such as artistic crosswalks. To prompt the benefits that placemaking can bring people such as improved socializing and happiness make the smaller spaces and bring them closer to where people live, work and play. The photos above of a sidewalk corner and a converted street slip lane in Montréal demonstrates how effectively our streets and sidewalks can be transformed to create places for people to stay, despite how infrequently we think something such as a sidewalk as a public space. This includes simple changes such as adding benches to a sidewalk and some murals to blank walls. All we need is some paint, some wood and voila we can transform our spaces. People attract other people, therefore people are also a prompt. If we design spaces to attract people then it will generate a self-reinforcing cycle that attracts more people to them. Through attracting people public spaces prompt the benefits of increased social interactions and physical interactions. However it is also important to clear our public spaces of snow in the winter, a time when they are needed the most due to low solar levels. We could even introduce some climate control to public space. These measures would make prompt people to get out of the house in the winter and mingle with other people. Density: Where is the sweet spot? After reviewing numerous studies and urban planning sources, in almost all cases density is never cited as the sole important factor for successful, lively and vibrant cities. Density plays a role nonetheless and an important one in a larger comprehensive package of urban interventions. Paying attention to the finer details for all aspects of the city built form and civic services will ultimately create a great place to live, work and play. The question is not about how dense it should be but rather how density is done. Rowhouse developments like these have the same density as high rise towers but spread the density to cover more ground while avoiding awful downdraft winds and boring spaces. The conclusion is inescapable; there should be much less focus on the numbers of density. Not all density is equal, we can have a sea of high rises, but if the change is too drastic or you forget vital features like safe and inviting sidewalks or places to shop and eat, there may be little to no street life or sense of place. Density needs to be grounded in its context. It will not succeed without the scale, form and details that create irresistibly interesting places. These interesting places can be designed in such a way that it does not feel dense, but people still naturally want to be there. While we should always begin with the goal of creating interesting places where people will naturally gravitate to live, work and play, we can use density thresholds to inform and guide our decisions. A complete street design with a bidirectional protected bike lane with a floating bus stop. How we get around is a big topic these days and it isn’t a surprise that many sources and studies offered density thresholds for successful public transportation and lower vehicle miles traveled. Toronto’s historic streetcars provide an example of the possible frequencies possible with denser built forms. It is however always recommended to provide dedicated right of way to ensure maximum reliability. Sources like Paul Mees’ Transport for Suburbia question the validity of some well cited transit planning sources such as the 1955 Chicago Area Transportation Study (CATS), or Peter Newman in their expression of the importance of density for transit. Mees’, using Metro Zurich (4.5 dwelling units per acre/32 persons per hectare) as an example, argues that while density does play a role in higher transit usage. However there are other important factors which include governments maintaining control of the right to design the transit network, long term strategic planning, and fare rates. Also important is the inclusion of an integrated pulse timed, cross city network of multimodal, transfer based routes. A human scaled and surface level streetcar system along a low density commercial strip in Toronto. Patrick Condon in his Seven Rules for Sustainable Communities conducted a case study of the Vancouver streetcar neighbourhoods, and advocates for linear commercial corridors supported by transit. Condon found that frequent bus service (7 minute headways) could be accomplished with 10 dwelling units per gross acre, while a streetcar could be supported with a density of 17-25 dwelling units per acre. Condon argues that our greatest opportunity for creating sustainable suburbs is to focus investments in densification and transit along suburban low density commercial strips. Just 10% of a commercial strip would have to be developed at 40 dwelling units per acre increasing the average area density to 10 dwelling units per acre. Most people have an average 5 minutes walking threshold. Therefore to reduce car trips significantly the number of people with their necessary shopping of everyday goods and services within a 5 minute walk should be maximized. Often transit planning tends to focus on nodes, however this does not maximize the 5 minute catchment area. Instead transit should be focused at commercial corridors where pedestrians can link various trips as they walk to and from the transit on their way to work. Otherwise there are numerous studies and sources showing density is tied to fewer Vehicle Miles Travelled (VMT) and supporting alternative transportation modes. One study conducting a comprehensive literature review cites a study by Larry Frank, which states that a 33% reduction of vehicle miles driven per day can be achieved with twice the density of the typical low density sprawl in addition to a diversity of uses, interconnected streets. This was also confirmed by other separate studies where the VMT and car ownership could be reduced 29-37% and 16% respectively by doubling the density. To produce significant reductions in automobile work related trips, 50-70 employees per acre and 12 dwellings per acre is needed, while non-work trips are reduced above 75 employees per acre and 20 dwellings per acre. Typical 3 storey row house design in Montreal. A recent study analyzing the 2003 U.S. Residential Energy Consumption survey, and 2001 U.S. National Household Travel Survey found that Household carbon footprints increase until 4.7 persons per acre, afterwards decreasing per ten-fold increase in population density leveling out at 78 persons per acre . Keeping this in mind, towers and single family houses have the most surfaces (walls and roofs) per household exposed to the elements, increasing the energy usage required per household. Patrick Condon pegs 20-65 dwelling units per acre as the optimal range, which includes combinations of duplex, quadplex, townhouses, row-houses, and apartments. All of these can be shaded by trees from both the sun and wind, and require less elaborate heating and elevator systems. It is not enough simply to build in this density range, a compact organization of households must be ensured to promote good shading, encourage walking and biking while minimizing the need for parking and paved surfaces. With higher densities it is possible to service local amenities at a lower cost per person. Cost analysis studies show that it is less expensive to construct and operate infrastructure and services for denser developments instead of single family housing. A Canada Mortgage and Housing Corporation (CMHC) study finds that alternative development principles with a finer mix of land uses, higher residential densities, a transit supportive street grid design, etc. would see approximately a 16% decrease in infrastructure construction cost per unit. Smaller corner store sized produce or grocery stores help prevent food deserts. Many cities are adopting strategies to become the healthiest city based on a wealth of studies providing evidence that 30 minutes of brisk physical activity is a free “super drug” that can help reduce the levels of obesity and diabetes which can be encouraged with compact, walkable environments. One study found that for every 1% decrease of population living in dense areas would see 0.01-0.02% increased prevalence of obesity. By creating compact, connected, safe and interesting places, people will naturally include walking or cycling in their everyday activities and errands. Fine grain mixed land use is the most efficient with retail uses typical occupying the first floor and residential uses occupying 1-2 floors above the ground floor. Places to shop are crucial ingredients for creating interesting places. Corner stores can act as community hubs, restaurants and bars are places to catch up with old friends and make new ones. The corner store (1500 to 3000 sq ft) is the smallest and most useful community oriented type of retail center. Either stand alone or built into a mixed use building, a corner store can be economically sustainable with 5-6.25 dwelling units per acres when sited on a primary street and located next to community buildings, parks, and schools. An example of a larger shopping center designed for an urban context with no surface parking. A neighbourhood center (50,000 to 70,000 sq ft)  offering the everyday goods and services required by households anchored with a supermarket, pharmacy and restaurant is often considered the core of the traditional neighbourhood. To be economically sustainable a neighbourhood center needs 12-16 dwelling units per acre. 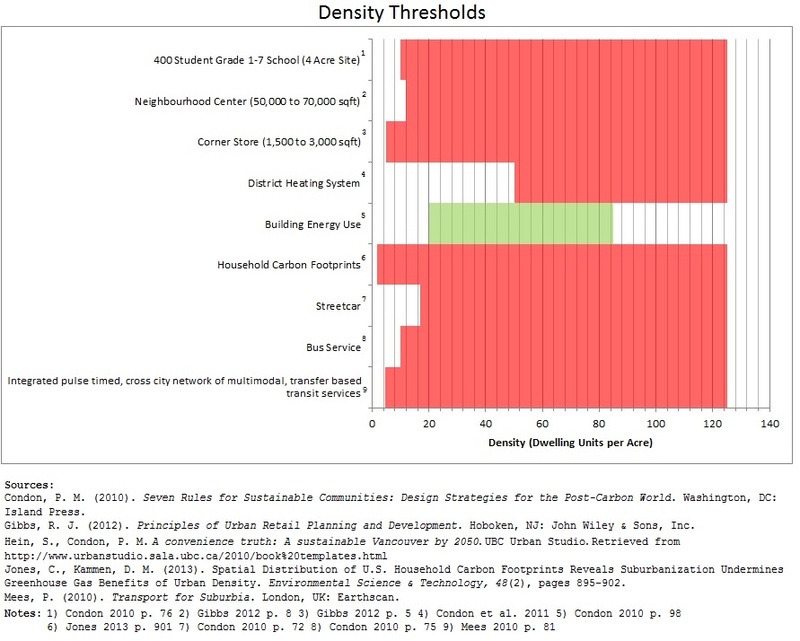 One can conclude that the density sweet spot ranges from 20-65 dwelling units per acre. This can include combinations of duplex, quadplex, townhouses, row-houses, and apartments and is enough to support a cross-city multimodal network of high quality, reliable. frequent transit services, and the necessary neighbourhood retail goods and services while minimizing the Vehicle Miles Traveled, Household carbon footprint and energy usage. Densification is a long term strategy, where the focus should be on increasing density incrementally targeting specific areas such as commercial corridors, or the densification of inner city neighbourhoods. An example of an inner city neighbourhood quadplex in Edmonton, quadrupling the density on the same land and demonstrating the potential for densification. Inner city neighbourhoods are a great place to focus densification strategies, as most of the 50-75 year old houses are nearing the end of their life. These existing neighbourhoods can be incrementally densified without the drastic changes that drain existing community capital. Authors like Dunham-Jones, Williamson, Campoli, and Von Hausen outline many changes for more compact inner suburbs such as legalizing infill, smaller lots, and secondary suites in the basement, garages, and laneway houses. Cities can also allow the medium density housing options duplexes, townhouses, row-houses, quadplexes that conform to the existing scale and form, while also eliminating setbacks, replacing minimum with maximum parking requirements, allowing more creative shared parking solutions, and supporting a diversity of housing types, sizes, and occupancy types. Similarly new suburbs should be designed more compactly using creative clusters, a mix of housing types, and thoughtful orientations to minimize the footprint, the need for parking and asphalt, and energy requirements. David Sucher says that people will naturally want to live dense if you build interesting places. Interesting places such as your bustling main street of your favourite trendy shops, restaurants, pubs or hang outs entice people naturally. We need to turn our thinking on its head, focusing less on the hard numbers of density and more on the smaller details that collectively define great places. Public seating in the form of benches give people the opportunity to take up public space and essentially extend their living room in denser environments. These details start from the benches, streetlamps, and trees that reflect our pride and community spirit. It also includes the great community buildings, public spaces and commercial retail spaces that offer community programming, the necessary shopping and services and places to gather. It includes a comprehensive multi-modal transportation system that provides people with a more than a singular automobile choice. Finally, it includes a mix of uses and housing options to meet the needs of a variety of families, ages, cultures and income levels. Density by itself is not enough, it is one of many ingredients needed to make great communities. Density comes in many forms and should complement the existing neighbourhood character, using architecture and design to incrementally increase density while still matching the scale and context of the surroundings. We have the tools and knowledge to make density beautiful, interesting and enjoyable, so that density does not seem dense. It is not a question of how dense a neighbourhood should be but rather how the density is done. Ewing et al. 2008, p.16. Condon et al. 2001, p. 2. Jones et al. 2013, p. 901. Jeon et al. 2007, p. 750. Zhao et al. 2010, p. 786.